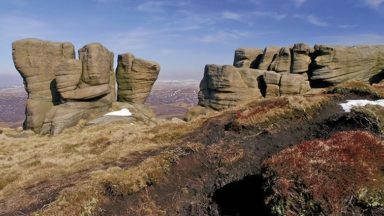 The moors of the Peak District’s Dark Peak have been an important area for walkers and climbers for over a hundred years, with many well-established footpaths, which may be linked into challenging walks often involving passages of trackless peat bog. Less well-known are the area’s many opportunities for hands-on ascents, up gullies, brooks and cloughs, where scramblers can keep fit and hone their skills year-round. 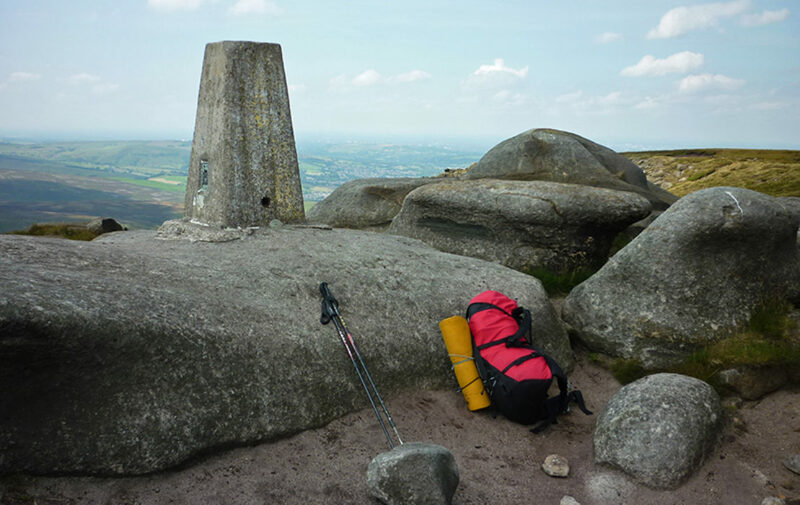 Here Tom Corker, author of Cicerone’s Scrambles in the Dark Peak, strings some of the guidebook’s routes into a two-night Dark Peak adventure. 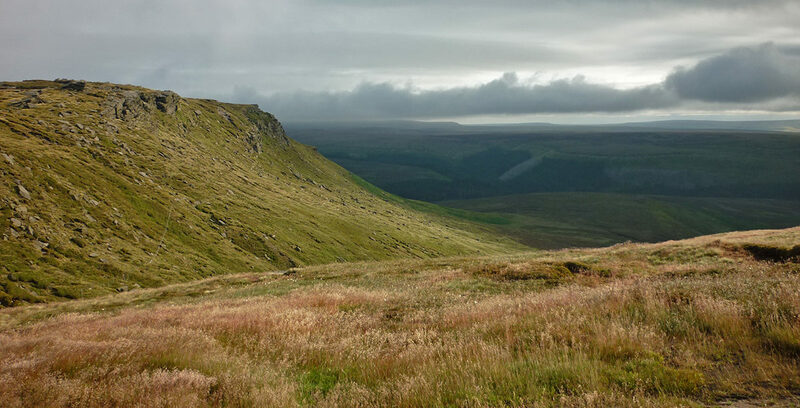 The most famous route across the Dark Peak, is of course, the Pennine Way, these days almost paved. 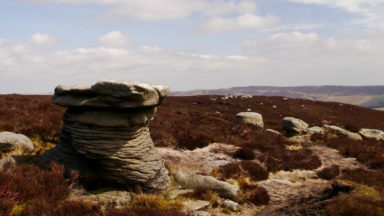 Then there are classics – Derwent Watershed and Marsden to Edale. These last two are usually done in a long day, or even run in a few hours! 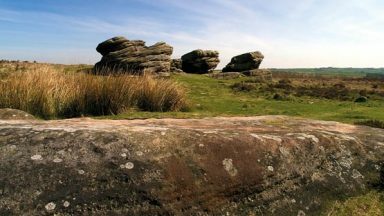 For some time I had been considering an alternative, joining some really good scrambles with stretches of trackless moorland and visiting some interesting places along the way. So here’s the idea: Chew Valley to Edale, Wilderness Gully East to Grindsbrook, six scrambles across a total of 18–22 miles. Okay, so much for the idea. What was needed next was a period of good weather, some level of fitness (a problem! ), and lifts to the start and from the finish. The weekend of 7 to 9 August 2015 was chosen. In view of my ageing body and creaking knees I decided to bivouac en route. I justify this by saying that spending nights out alone on the moors is not to be missed: it adds to the adventure and besides, it means you have to carry more gear. 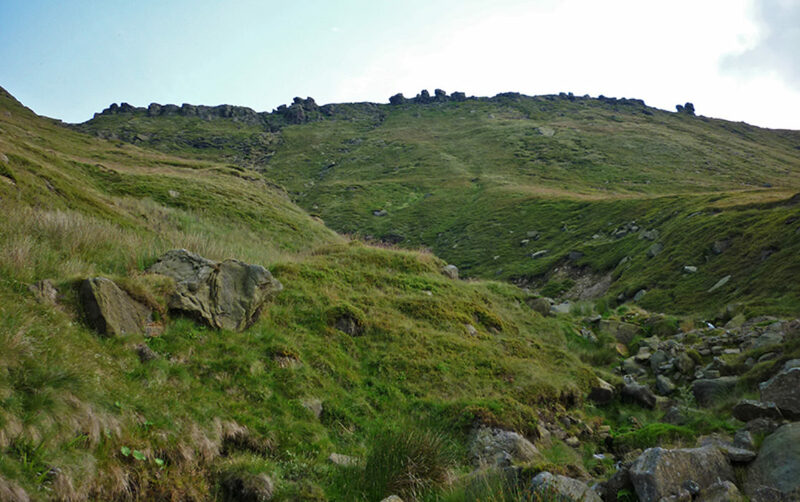 In order to reach reasonable water for my first bivouac I decided to miss Rimmon Clough (Route 1 in the guidebook), saving me about 3½ miles. Setting out from Dovestones Reservoir Car Park at six o’clock I headed up the track to Wilderness Gully East (Route 6), a wonderful classic scramble. The final approach proved to be boggy but the rock was completely dry and I was feeling fresh, so the 350 feet of ascent went well, even with the heavy sack. With time pressing I set off on the path past Chew Reservoir towards Laddow. In places the going was very wet, but crossing the watershed I was treated to a beautiful sunset over Chew Reservoir. I was heading for the Pennine Way and Oaken Clough Brook, and just before this I found a reasonable source of water and a handy flat spot for a bivouac. I had brought the flysheet from my Quasar tent to provide shelter from midges and the resulting structure, using an ‘A’ frame fashioned from my two walking poles can only be described as…embarrassing! Luckily it was growing dark, and no one was around. I had read somewhere that Mick Fowler uses instant noodles on his multi-day epic ascents, so they must be good. In actual fact with the addition of a Mexican tuna ‘bean thing’ it was not bad. I had boiled enough water for tea at the same time and by now the midges had found me. If you do this make sure that you have repellent – and a head torch. It crossed my mind that the midges might be the reason the meal was so tasty! Not too bad a night, great to be alone on the moors, amazing view of the lights on Holme Moss radio mast and an epic struggle to get out of my ‘A’ frame construction to go to the loo in the night. An early start the next morning. Breakfast bars, tea and chocolate, using excess boiled water from my water bottle. Down the Pennine Way towards Crowden, across the reservoirs in Longdendale heading for Torside Gully (Route 19). The approach was blighted by high bracken (is it mutant?) climbing the enjoyable gully. I noticed the pull in my shoulders properly for the first time. 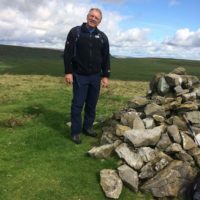 Once on top, again on the Pennine Way I followed the path eastward until adjacent to ‘Torside Castle’ and then across strenuous open moorland due south – take a compass – towards Dog Rock. Then came a steep grassy descent, the two trekking poles proving their worth, to Yellowslacks and Dowstone Clough (Route 20). A bit of a stumble up to the waterfall bypassed on the right by clambering up a loose gully and traversing back left into a basin. Good rock on the left leading to the bedrock of Dowstone Clough and a welcome tea stop. I had decided to try the glucose gels favoured by cyclists: it seems to work for them so I decided to give one a try. Perhaps it helped. Pleasant walking on dry gritstone bedrock with small steps ensued, until I was forced out onto a path on the left bank. It’s important to hit the correct junction for the path (not marked on the map) to Higher Shelf Stones, located where a grassy widening occurs on the right bank. The path follows grassy groughs, is fairly well used and leads directly to Higher Shelf Stones. Great views and my first human contact since leaving Chew Valley. From here there is a reasonable path – unmarked on the map – heading south east to join the Pennine Way, which I followed to the Snake Pass road (water could be cached here if required). Across the road the Pennine Way, now paved, can be followed for a while until it starts to bend towards Mill Hill. I had previously reconnoitred this section – but still made a mess of it! Crossing the open moorland due south, trying to pick up little tracks heading for Ashop Clough and Nether Red Brook (Route 27), I got suckered into following a vague track into red clough: don’t do this! This year more desperate bracken and much stumbling about. Instead, keep heading straight for Nether Red Brook on the open moor. Much relieved I arrived in Nether Red Brook, which in summer has lovely clear spring-line water. More welcome mugs of tea. My bivouac shelter (Mark II) involved a flat sided rock with heather and grass on top to which I could peg the flysheet and then pull it out and tension inside with the trekking poles. I was quite pleased with this – see later! There was a refreshing breeze as I had a leisurely repast. More noodles, this time with sardines: nearly gourmet I thought, but maybe I was just desperate for something salty? By now I was feeling pretty relaxed, not a soul about, lovely weather, sheep securely fenced out – then the breeze dropped. Midges! ‘No problem’, I thought, ‘just pop into the bivouac’. As I lay down I began to notice clouds of midges inside: had they the same idea as me? Or maybe they had been disturbed from the heathery rock. Thank goodness for repellent! A reasonable night’s sleep, marred only by another desperate struggle to get out for the loo in the middle of the night (do you know, I really think I’m getting too old for all this...). When I woke in the morning there had been a little rain overnight, not much, but enough to make the rocks a little slippery. So, after tea, breakfast bars and chocolate a careful clamber up the route, which is interesting and longer than it looks from a distance. Once on the plateau path I turned east for a short while then roughly south east over now grassy terrain, heading for the top of Fairbrook: not as obvious as it used to be, this shortcut. From Fairbrook I followed the path along the Edge to Seal Edge. Next it was due south (compass essential) across the Watershed to Grindsbrook. This traverse is now grassy, some of which is long and obscures holes and ankle-catchers. 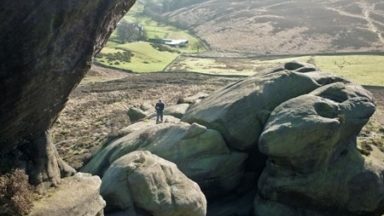 Grindsbrook has a good path leading to the edge and an easy clamber down excellent rock (Route 35) in a great location. I decided to climb back to the plateau using the pleasant little gully mentioned in the route description, so that the final descent to Edale would be from Grindslow Knoll – great views. This is a straightforward, if steep, descent for tired legs. Stopping at the top of Grindslow Knoll I obtained my first mobile phone signal to call Alex and Richard, who would pick me up from Edale, where incidentally I met my first person since leaving the snake pass. Home for lunch and a bath! Did I enjoy it? Yes, very much, a great experience – I can say this now because I’ve recovered! All these routes could, of course, be done with a single bivouac – maybe Yellowslacks for spring water – or even in one long day by a fit lightweight party. The ‘real’ challenge would be to do it in full winter conditions!